Corporate gifts are a great way to impress new employees and customers by creating a lasting image for your brand. These premium corporate gift ideas are essential to building a stronger brand image, as well as generating a strong customer or employee relationship. Leather is a high-end and premium material. It holds a high value among gifts, and whether it be genuine leather or PU leather, it promotes a prestigious gift. 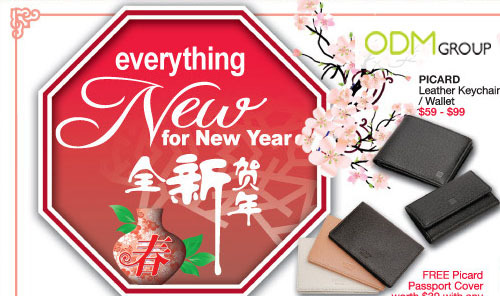 In addition, leather products are long-lasting and a higher chance the client will have the product for a long time. Thus, you can consider embossing your company logo on the premium leather gift. If your client uses your leather product daily, there is an increase in the recall of your brand name! This could lead to an increase in sales in the future. Never underestimate the power of small gifts. Premium keychains are useful gifts suitable for any client. Keychains can be attached to multiple things including bags or car keys. If the keychain is well designed, customers are more likely to hang your premium gift on their bags. Marketing gift ideas provide a high visibility of your brand name. 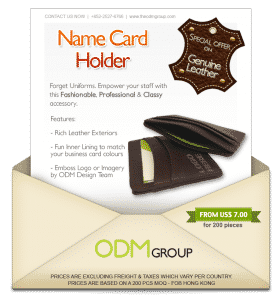 Special Offer for High-End Name Card Holders! Name cards are a must-have with all professional businesses. 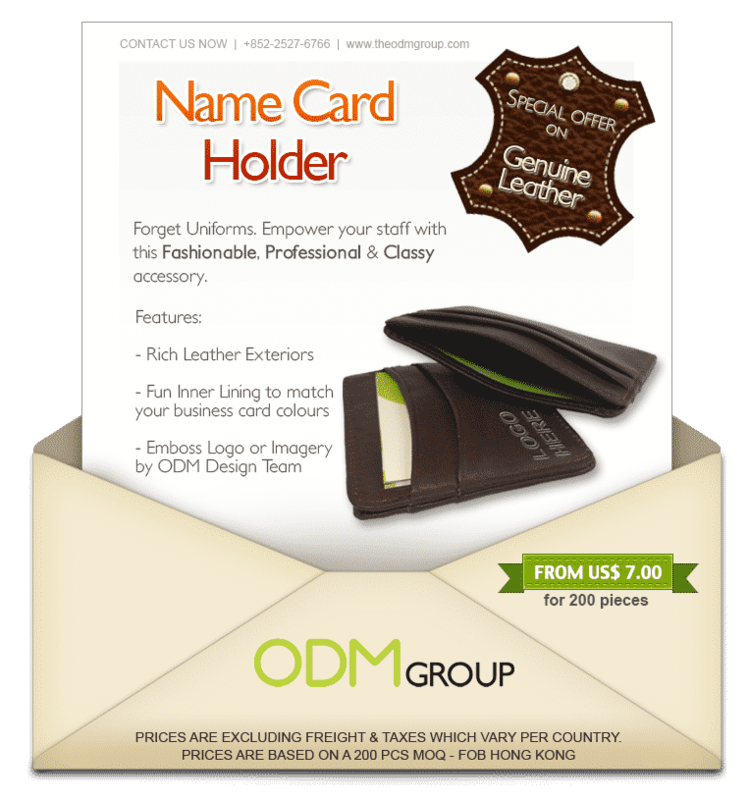 Thus, leather name card holders are great vip corporate gift ideas. It is a practical gift which is crucial because this will increase the usage of the product and enhance your brand image with your clients. 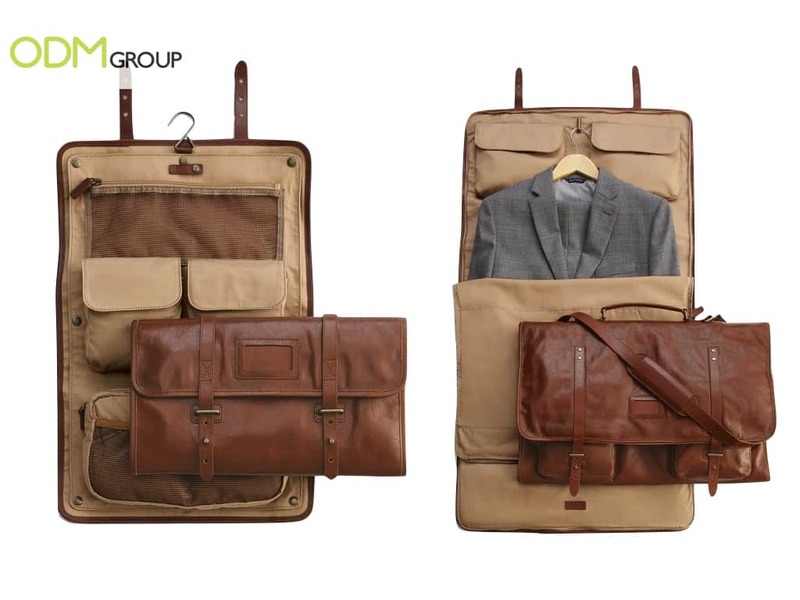 Clients who travel frequently will definitely find a need for quality garment bag to hold their suits. Thus, a handy and sturdy garment bag will suit their needs perfectly. This can help to create good relationships with your clients and increase brand loyalty. By catering to their needs, your clients will feel that you understand them fully and will want to work with you in the long run. These garment bags are stylish and professional looking. This stylish and uniform leather duffel bag has many great features including being spacious, having classy gold detailing, and sturdy handles. As your clients are bound to travel on a regular basis, a duffel bag can also double up as a travel bag. With your company name going around the world with your client, your brand name will be seen in many different parts of the world! A gift which is suited to both men and women. It can be used as a toiletry bag, which can be taken away travelling. When customised, leather makeup bags are stylish. People will be complemented on the great design of the product. Sleek and simple, a leather passport cover is practical. For travel companies, this gift would be used often. This gorgeous Swarovski jewellery box is a stunning gift for customers. It can come in any customised colours you would like to choose. 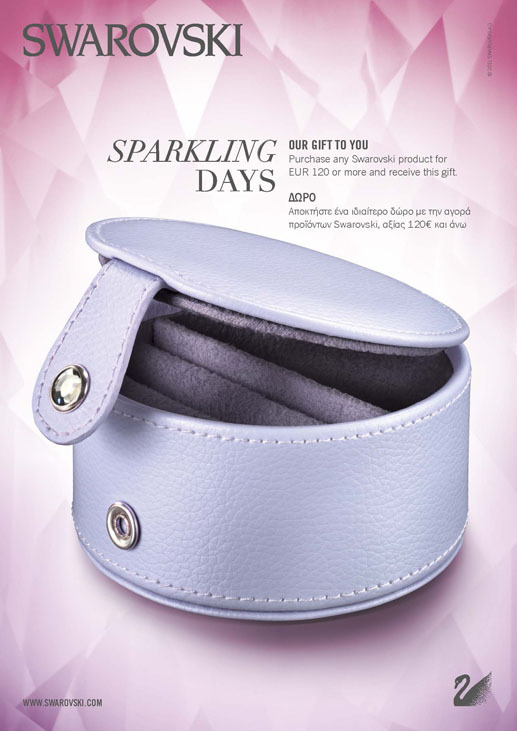 The attention to detail on this box include the precise stitching, rhinestone buckle and felt material on the inside. A quality gift like this one is sure to leave a lasting impression on anyone who receives this premium gift. Cufflinks are highly customizable and you can consider having your brand name as the design on the cufflink to increase brand awareness and boost marketing efforts. 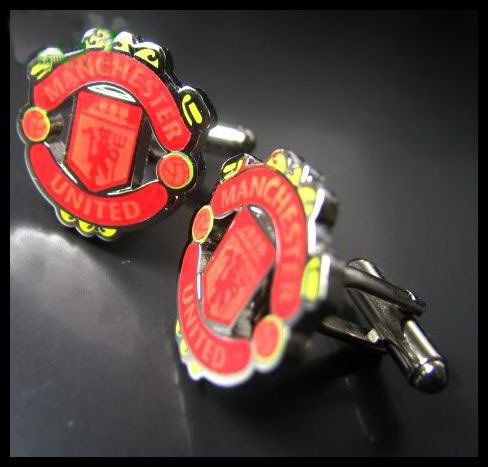 The shaping, colours, and detailing of these cufflinks can be personalised and branded. Creating a great range of brand merchandise is great for brand awareness. You can create a specific brand image with branded merchandise. This wine accessory is a great idea as a corporate gift. Some corporate meetings are carried out with a glass of wine, which would make it a handy gift for the office. Similarly, wine is drunk with dinners and celebrations, making a wine accessory practical and thoughtful as a premium corporate gift. The designs are sleek and modern. 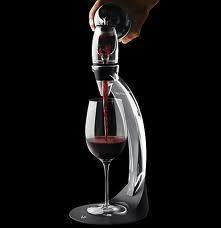 The accessory pictured above is a wine aerator, which is used to enhance flavours and aromas. 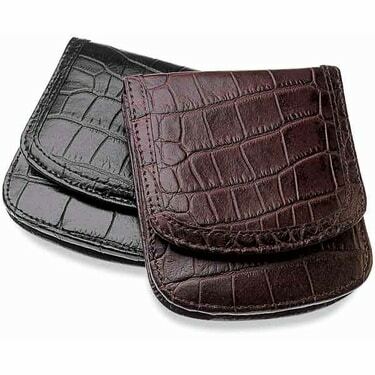 Simply, wallets are a highly practical corporate gifts, and a great addition to any branded merchandise set. 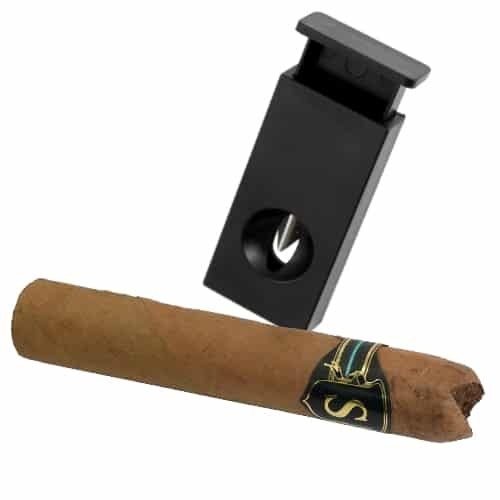 A cigar cutter can be used by the many people that smoke cigars. These tools would be a great promotional brand product for tobacco brands. These have a high end feeling to them. 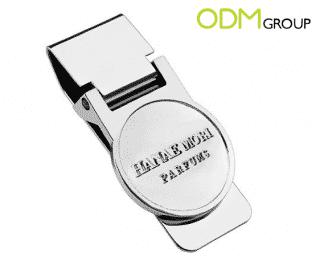 Branded money clips are another great gift great for any new employee or client. Like all of the gifts in this post, it is practical and stylish. You too can create corporate gifts for your company. A practical and thoughtful company gift idea. Video brochures are the latest industry trend in the world of luxury merchandise. They work like a usual brochure but has a LCD screen attached. This would be a perfect gift to send it to your VIP clients as an invite for a glamorous event or to introduce a new product. The possibilities are endless! Premium corporate gifts are important for all industries. Although the luxury goods industry use premium gifts often, such high-end goods are also beneficial to your VIP clients, large clients and high-end clients. 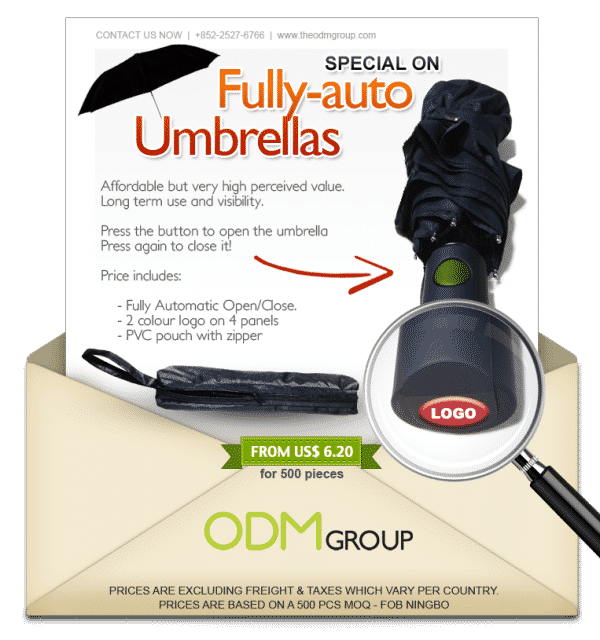 It would definitely shine a positive light on your brand if you offer such premium goods to your clients. Contact The ODM Group today for all enquiries about manufacturing and design enquiries. We have a professional team who are here to help with any of your own luxury corporate gift ideas. We hope you have found inspiration in some of the branded corporate gifts. These neon corporate souvenirs are a unique gift. They stand out and will always be a talking point for any household. Gifts like these create great brand awareness. Here is a great example of simple yet effective branded products in duty free. While is is not a corporate gifts, this blog will give you some great design ideas. Branded Gift with Purchase – Bentley Scores Big in Duty Free! There is nothing you can’t make branded. Whatever your company has in mind, the team at ODM can help you bring your vision to life. See this post about branded wall mount bottle openers for inspiration. Need more gift ideas? Check out this blog about promotional mugs and the positive effective it can have on your brand image. See this blog post about how to set up your very own corporate merchandise store for your brand. This idea can create a strong brand image and awareness for your company. At ODM, we can help you start it up.